(Nanowerk Spotlight) Developed originally for the surface finishing industry, diamond nanoparticles are now finding new and far-reaching applications in modern biomedical science and biotechnologies. Due to its excellent biocompatibility, diamond has been called the Biomaterial of the 21st Century and medical diamond coatings are already heavily researched for implants and prostheses (see: Nanotechnology diamond ice coatings could improve knee prostheses and solar cells). Nanoscale diamond is also being discussed as a promising cellular biomarker and a non-toxic alternative to heavy metal quantum dots. Further extending the nanomedical use of diamond, researchers now have demonstrated a nanodiamond-embedded device that could be used to deliver chemotherapy drugs locally to sites where cancerous tumors have been surgically removed. "Our work has shown that nanodiamonds serve as versatile platforms that can be embedded within polymer-based microfilm devices" Dr. Dean Ho tells Nanowerk. "The nanodiamonds are complexed with a chemotherapeutic, and subsequently enable sustained/slow release of the drug for a minimum of one month, with a significant amount of drug in reserve. This opens up the potential for highly localized drug release as a complementary and potent form of treatment with systemic injection towards the reduction of continuous dosing, and as such, attenuation of the often powerful side effects of chemotherapy." Ho, an Assistant Professor in the Departments of Biomedical and Mechanical Engineering at the Robert R. McCormick School of Engineering and Applied Science at Northwestern University, together with collaborators from Nanocarbon Research Institute, Asama Research Extension Center, at Shinshu University in Japan, and the Robert H. Lurie Comprehensive Cancer Center of Northwestern University, have described the development of their flexible microfilm patch in a recent online edition of ACS Nano ("Nanodiamond-Embedded Microfilm Devices for Localized Chemotherapeutic Elution"). 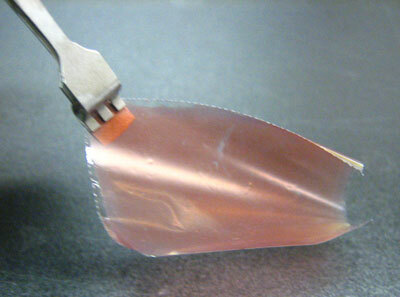 One of the big advantages of this micropatch, which resembles cling film and can be customized easily into different shapes, is that it prevents a significant downside of conventional therapies – the often-observed large-scale initial release of toxic drugs, which also precludes long term drug release. "Slow and sustained drug release that eliminates the 'burst' release effect was an important component of our work" explains Ho. "Furthermore, our research has resulted in a highly scalable technology in that the chemical vapor deposition capabilities of the polymer microfilm, coupled with its batch synthesis, purification, and functionalization of the nanodiamonds with the drug, allow for massively parallel microfilm fabrication capabilities." As such, nanodiamonds are quite economical, enabling the broad impact of these devices towards a spectrum of physiological disorders e.g. serving as a local chemotherapeutic patch, or as a pericardial device to suppress inflammation after open heart surgery, a key need in cardiothoracic medicine. In their study, Ho and his colleagues embedded millions of tiny drug-carrying nanodiamonds in the FDA-approved polymer parylene. Currently used as a coating for implants, the biostable parylene is a flexible and versatile material. A substantial amount of drug can be loaded onto clusters of nanodiamonds, which have a high surface area. The nanodiamonds then are put between extremely thin films of parylene, resulting in a device that is minimally invasive. Illustrated schematic of hybrid film patch. 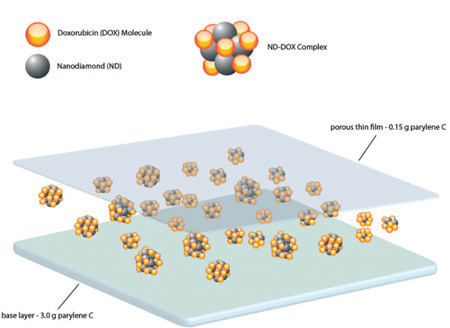 Nanodiamonds and doxorubicin hydrochloride molecules bound through physical interactions in various configurations are deposited atop a base layer of parylene. A final layer of parylene film is then deposited for additional elution control. (Reprinted with permission from American Chemical Society). To test the device?s drug release performance, the researchers used Doxorubicin, a chemotherapeutic used to treat many types of cancer. They found the drug slowly and consistently released from the embedded nanodiamond clusters for one month, with more Doxorubicin in reserve, indicating a more prolonged release (several months and longer) was possible. "Our nanodiamond patch could be used to treat a localized region where residual cancer cells might remain after a tumor is removed" says Ho. "If a surgical oncologist, for example, was removing a tumor from the breast or brain, the device could be implanted in the affected area as part of the same surgery. This approach, which confines drug release to a specific location, could mitigate side effects and complications from other chemotherapy treatments." Another example that Ho mentions is the important need in cardiothoracic medicine for a device that can slowly release anti-inflammatories or anti-scarring agents after open heart surgery while only having a small footprint. The micropatch with its micron-scale dimensions fits this bill and can be considered only minimally invasive. Ho notes that after open heart surgery, a large percentage of patients experience scarring or inflammation that can lead to congestive heart failure, arrhythmia, etc. "We envision that a thin strip of the microfilm device can be placed near the heart to slowly release anti-inflammation drugs, which can reduce serious infections and post-operative complications" he says. "Overall, a key benefit of this technology towards the aforementioned applications, as well as other medical applications is that it can serve multiple functions – e.g. a shield against scar tissue, a multi-drug release device – in one system while also being scalable and scalably produced." The research team is now exploring the use of nanodiamonds to explore a broad range of therapeutic classes, including additional small molecules, proteins, therapeutic antibodies, RNAi, etc. Ho says that they are also exploring animal model work to assess the in vivo therapeutic efficacy of their system. An area of paramount importance towards the realization of the translational significance of this work will involve determining how the nanodiamonds are processed by the body post-drug release, and to develop strategies to ensure that they are removed after drug delivery. Preliminary studies have indicated that they are amenable towards biological surroundings, and important continued work in this area will explore their long-term interaction with animal models.